The Shanghai International Gold Exchange (SGEI), located in Shanghai’s Free Trade Zone, is the international trading division of the eponymous Shanghai Gold Exchange (SGE). Three gold contracts are listed on the SGEI, the most popular of which is the iAu99.99 contract. However, most trading of the iAu99.99 is executed bi-laterally over-the-counter and merely settled through the Exchange. Many of the large Western bullion banks are international members of the Exchange including HSBC, ANZ, JP Morgan, Scotia and UBS, as are some of the world’s best known gold refineries such as MKS (PAMP), Heraeus, and Metalor. The gold backing trading of SGEI contracts is held in a distinct gold vault within the Shanghai FTZ that is operated on behalf of the Exchange by Bank of Communications. This vault has a storage capacity of 1000 tonnes of gold. International members of the Exchange can trade on both the SGEI and SGE. Likewise, domestic members of the Exchange can trade in SGE and SGEI contracts, but gold related to SGEI trading cannot move out of the Free Trade Zone. 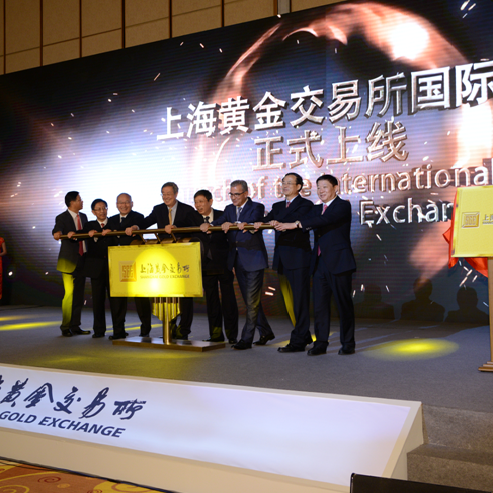 In September 2014, the Shanghai Gold Exchange (SGE) established a physical gold trading and custody platform aimed at international gold investors, launching this platform as the “Shanghai International Gold Exchange (SGEI)“. The Shanghai International Gold Exchange can be viewed in a number of ways. Organizationally, the SGEI it is a fully-owned subsidiary of the SGE and is registered in the Shanghai Pilot Free Trade Zone (FTZ). The SGEI’s offices are also located in the Shanghai Pilot FTZ in the Bank of China Tower, 200 Yincheng Road Central, Pudong, in Shanghai. From a trading perspective, SGEI refers to the “International Board” of the Exchange. On this Board, a number of physical gold contracts (products) specifically designed for international gold investors are listed and traded. Since these products are physically delivered gold contracts, the SGEI infrastructure also encompasses a certified precious metals vault where the physical metal backing this gold trading is stored. This SGEI certified vault is also located in the Shanghai Pilot FTZ and is ring-fenced from the SGE’s network of gold vaults that serve the domestic Chinese gold market. The gold in the SGEI vault can be freely imported into and exported from the FTZ since the FTZ is deemed to be outside of China for customs purposes. From a corporate perspective, the SGEI’s remit spans “international market development, international members’ management and offshore investor services“. The SGEI and SGE are physically separate entities, but they operate under the same umbrella (‘The Exchange’). Since the SGEI is known as the International Board (IB), the SGE is sometimes referred to as the Main Board (MB) of the Exchange. The SGEI offers 3 Renminbi-denominated physical gold contracts to international members and their customers. Since the Chinese gold market is not yet fully liberalised (and exports of gold out of China are generally prohibited), the gold underlying these international products has to be segregated from the domestic Chinese gold market. Hence the SGEI is located in the Shanghai FTZ, a zone which is considered to be outside of China for customs purposes and where the underlying gold can be imported into and exported from the SFTZ without needing to comply with domestic Chinese customs procedures. In general, a free trade zone is a designated area within an economy that allows goods to be imported, stored, processed and re-exported with little customs intervention. International members of the SGEI and their customers can also trade Main Board SGE products, however, gold related to the Main Board contracts has to stay in the Chinese domestic market and is prohibited from being withdrawn from SGE certified vaults by these international members / customers. Likewise, domestic members of the SGE and their customers can trade International Board gold contracts, but these domestic members and their customers cannot withdraw the gold related to these contracts from the Shanghai Free Trade Zone (i.e. from the SGEI certified vault) unless they hold a license from the People’s bank of China (PBOC) which allows them to import gold into the domestic Chinese gold market. The Chinese currency, the Renminbi, trades in two versions which are known as onshore Renminbi (CNY) and offshore Renminbi (CNH). Onshore Renminbi (CNY) is traded in the domestic Chinese market and the PBoC sets the reference rate for CNY each day and aims to control its fluctuations within a 2% band through intervention if necessary. CNH is the code for the Renminbi when it trades in offshore accounts, and CNH is fully convertible into other currencies. The PBoC also at times intervenes to try to influence the rate of the offshore Renminbi. CNY and CNH are not two separate currencies, they are just two versions of the same currency. However, CNY and CNH have different exchange rates against other currencies (such as against the US Dollar). Both International Board and Main Board gold contracts can be traded using onshore and offshore Renminbi. Therefore following the launch of the SGEI, the Exchange (SGE and SGEI) now offers a connection between the onshore and offshore Renminbi markets. Domestic SGE members and their customers can trade SGE and SGEI products using either onshore or offshore Renminbi, and likewise, international members of the SGEI and their customers can also trade SGEI and SGE products using either onshore or offshore Renminbi. All 3 contracts are denominated in Renminbi and can be traded using onshore or offshore Renminbi. Unlike the opaque London Over-the-Counter (OTC) gold market and the COMEX gold futures market, the Shanghai Gold Exchange is a marketplace for physical gold. In contrast, the vast majority of trades in the London OTC gold market are denominated in unallocated gold which merely represents fractional claims on bullion banks for a quantity of gold (i.e. the bullion bank has a gold liability to the claim holder). Critically, there is very little physical gold in the London system backing the enormous volume of OTC gold trading. Likewise, there is very little physical gold in COMEX approved gold vaults in New York to back up the enormous volumes of COMEX gold futures trading. However, on the SGE, trading parties must hold the full amount of physical gold (seller) or the required funds (buyer) before transacting. Settlement is on a T+0 basis. As per the above list, each of these contracts has an ‘i’ prefix to distinguish it from the similarly named contracts that trade on the domestic SGE. With these OTC products, trading parties trade bilaterally off-exchange, and then clear their trades through the SGE. International members can also trade 8 gold products that are listed on the Main Board, but can only deposit and withdraw metal for the 3 International Board products. On the SGE International Board, trading predominantly takes place in the iAu99.99 contract, for example, 189 tonnes of gold traded in this contract during 2016. The iAu99.5 has rarely traded, and has seen no trades since late 2014. Likewise, the iAu100g has rarely traded, and its cumulative trading volume since launch is immaterial. But even the reported trading volumes for the iAu99.99 are surprisingly low, until it is realised that most international trading of the Au99.99 contract occurs on the OTC market through the iPAu99.99 contract, and the OTC trades are then handed over to the Exchange to settle and clear on the SGEI platform. This iPAu99.99 contract recorded 1511 tonnes in trading during 2016. The iPAu99.5 and iPAu100g contracts never have any trading volume. To qualify for international membership of the SGE, an applicant entity must be registered outside of the People’s Republic of China (PRC), but can, for example, be registered in Hong Kong or in the Shanghai Pilot Free Trade Zone. Therefore entities such as China Construction Bank Shanghai Free Trade Zone Branch and Bank of China (Hong Kong) Limited are classified as international members of the SGE. There are approximately 70 international members of the SGE, the majority of which are registered in China or elsewhere in Asia. But there are numerous international members from ex Asia, such as JP Morgan Chase (London), Scotia Bank (Canada), Standard Chartered (South Africa), UBS (Switzerland), ANZ (New Zealand), the Russian banks VTB, Sberbank and Otkritie, and the Swiss gold refiners PAMP and Metalor, and German refiner Heraeus. International members are either ‘Full Members’ (Type A members), Proprietary Members (Type B members), or ‘Special International Members’. Full members can engage in proprietary gold trading and gold brokerage, while proprietary members can only engage in proprietary gold trading. An example of a Special International Member is the gold mining association, the World Gold Council. In September 2014, the SGE announced the establishment of a certified metals vault in the Shanghai FTZ. This vault is operated by Chinese bank Bank of Communications. The SGEI vault provides physical warehousing for precious metals holdings of international members and their customers, and physical delivery services for the Exchange in relation to physical bullion trading. Delivery services for the Exchange are known as ‘Transaction Vaulting Services‘. Physical warehousing of metal for customers is known as ‘Safe Deposit Vaulting Services‘. The bullion deposited by international members / customers in the safe deposit vault is stored separately to the bullion that is in use in physical bullion trading. China’s state TV network CCTV has reported that the SGEI certified vault has a vault storage capacity of 1,000 tonnes of gold . The Exchange has issued specific rules and guidelines addressing physical gold storage and movements in and out of this vault, as well as in and out of the free trade zone area and covering importing and exporting gold to and from the FTZ. All SGEI international members and their customers must open an ‘FT Account‘ at one of 7 designated settlement banks for use in the settlement of SGEI gold trades. The FT Account System is an offshore Renminbi and foreign currency account system used in the Shanghai Pilot Free Trade Zone that is overseen by the Chinese central bank. The 7 commercial settlement banks designated by the SGEI are Bank of China, Bank of Communications (BoCom), ICBC, China Construction Bank (CCB), Agriculture Bank of China, China Merchants Bank, and Shanghai Pudong Development Bank. The SGE consults with a group of international advisors who advise the Exchange on market development and related international matters. Currently there are 18 advisors on the SGE’s advisor panel, drawn from an array of international industry bodies, trade associations, bullion banks and derivatives exchanges:. The above list of international advisors includes many of the top names in the the gold world and illustrates how the SGE is collaborating with the international gold market as it builds out its infrastructure and external market interfaces.